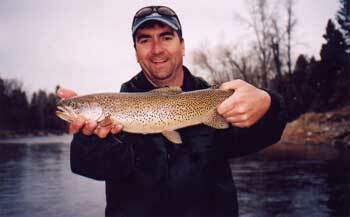 The Bitterroot River is a classic Montana trout fishing stream - small and intimate with many braids and channels. The Bitterroot's excellent insect hatches feed some really big fish. Float down Montana's Bitterroot river and cast your fly against a high cut-bank with huge fallen cottonwoods – they are providing cover for trout that will certainly leave you with some lasting memories. Montana fly fishing is best on the Bitterroot during the spring Skwala Stonefly hatch, and again in the fall when the days are shorter, and the water has begun to cool down from the warm summertime temperatures. Your Montana fishing guides will help you choose the right time to fly fish the Bitterroot river.